Tourists in Sanya hospitalized in suspect food poisoning. Nearly 40 tourists were hospitalized on 23rd April with suspectedt food poisoning in Sanya, reports hi.people.com.cn. The tourists, who come from Haikou, began to suffer headache, vomiting and diarrhea after having their breakfast in Sanxiangrenjia Restaurant in Sanya. 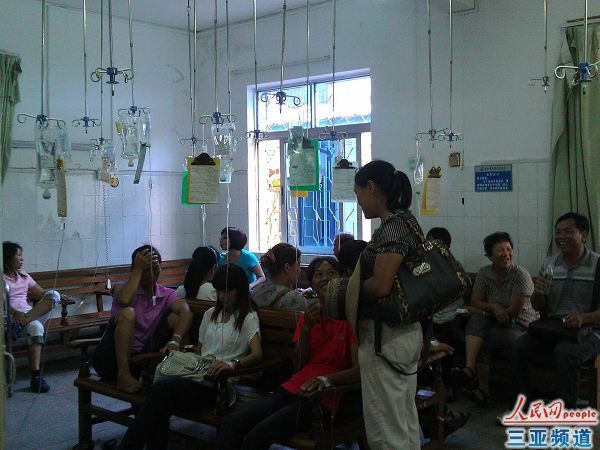 The sickened tourists have been sent to Sanya Nongken Hospital and Sanya People’s Hospital. According to the doctor in Sanya Nongken Hospital, the patients are all in stable condition now after treatment. The result of blood and excreta test shows that it was suspect food poisoning that sickened the tourists. Wang Xiurong, a village official of Haikou, said this trip is organized by the village committee to celebrate Women’s Day for the female villagers. Apart from 5 village officials and 4 children, the remaining tourists in the tour group are all female. According to Wang, they had steam buns, eggs, pickles and porridge for breakfast in Sanjiangrenjia Restaurant on that morning. Then some of them started to feel sick on their way to the Nanshan scenic spot. The manager of the restaurant admitted that they did have breakfast in his restaurant and feels sorry to what happened to the sickened tourists.